I am pretty much the #1 fan of store-bought rotisserie chickens. At least once a week (usually more often), I find myself buying one, either to just eat straight up with stuffing + vegetable, or to shred + use in all sorts of soups, stews, + casseroles. The rotisserie chicken really is a blessing to those of us who have limited time in the evenings to get dinner out on the table. So imagine my pleasure when I started looking through the latest cookbook to review (Southern Living: Quick Start Homemade), + there was a whole section devoted to my beloved rotisserie chickens! (They also have sections devoted to pasta, pastry + pizza dough, eggs, salad greens, + more). After looking through a bunch of amazing-sounding recipes, I came across a fantastic-looking one for Chicken, Spinach + Pepper Jack Cheese Enchiladas. As some of you know, I’m a huge fan of Southwestern + Mexican food, so I knew this would be the first recipe I tried. I put the husband in charge of the baby, did a quick grocery store run, + got cookin’. And y’all, these enchiladas came together SO easy + quickly + the results were fantastic! Not only were they awesome hot out of the oven on the first night, topped with tomatillo salsa, cilantro + avocado, but they made for scrumptious lunch leftovers for the next few days. If you’re like me – someone who loves to get a homemade dinner out on the table most nights, but needs it to be quick, budget-friendly, + healthy – you’ve got to check out this cookbook. It is full of some seriously easy + delicious recipes, + I know I’ll be trying lots more of them ASAP! OMG…these are GORGEOUS! Take it from a Texas gal who knows good enchiladas when she sees them. Can’t wait to try these out…I’m a huge roasted chicken fan too! Awww, thank you Wendy! And if anyone knows their Southwestern food, it’s definitely you, so that’s a huge compliment! I definitely need to use rotisserie more often. 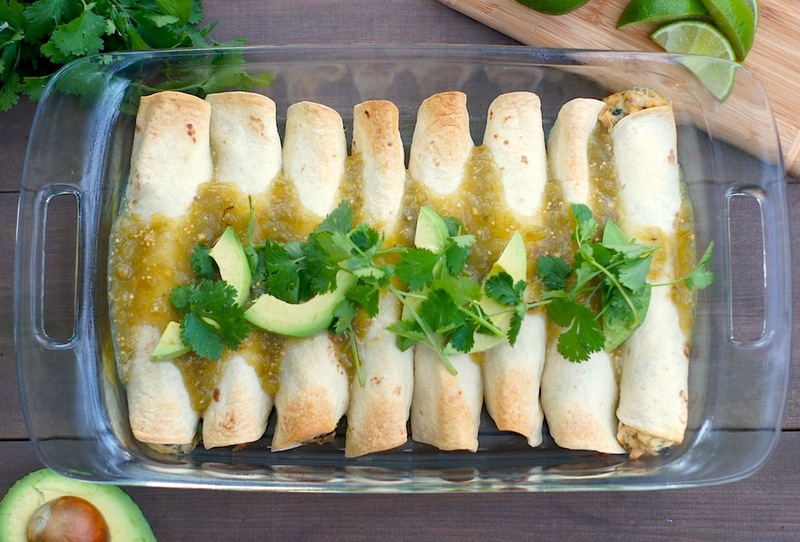 These enchiladas look like the perfect way to use it too! These look so good! I’m big fan of using rotisserie chickens too…such a huge time saver! This sounds delicious Amy! Store-bought rotisserie chickens are a godsend! So convenient and I absolutely love it. Heading over right now to check out the recipe. These look delicious. I love an enchilada and it’s so easy to mix up the recipe for variety. Enchiladas are so delicious and I love finding different fillings for them! These look really delicious and I love the addition of spinach. I love a good enchilada recipe. I make rotisserie chicken in my slow cooker – this is a great use for it. i heart anything Tex-mex or with Mexican flair. heading over to the recipe. how can i pin on your pagE? Hi Dixya! If you look right below the second picture, there’s a box that says “Share/Save” – if you click on that, then click on Pinterest, you can pin from there. Or the direct link to pin the first picture is this, or to pin the second picture is this. Thanks for the review, Amy. Your photos are gorgeous! 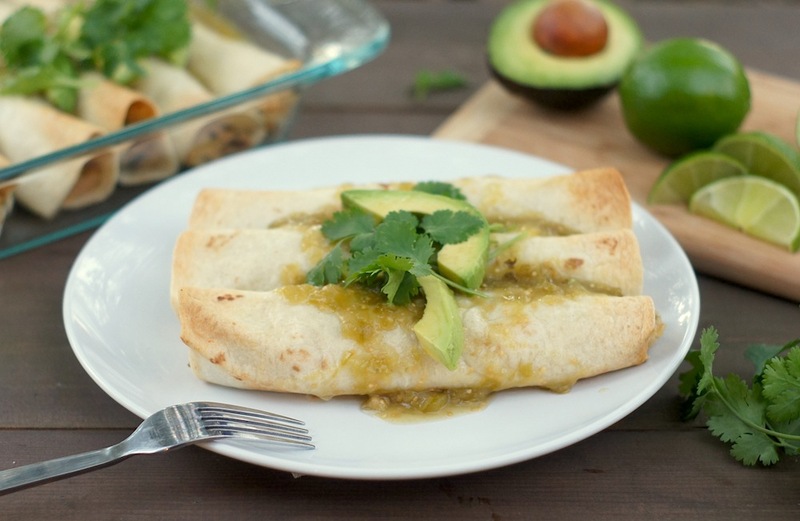 I love these enchiladas and they are exactly what I am craving for dinner tonight! I love enchiladas! So many possibilities. Have you tried sweet potato and black bean? One of my favorite combos: http://lesleyeats.com/2008/03/29/easy-sweet-potato-and-black-bean-enchiladas/ (gotta make sure to have a little citrus in there to make the sweet potatoes really “sing”). I have not tried sweet potato and black bean, but I must, because they sound fantastic! What a great dinner! I am with you – thank heavens for rotisserie chicken. It’s great to have on hand, whether for a meal in itself or for use in another dish like this one. I’m here in Southern California where there are lots of Mexican restaurants, and enchiladas are probably the thing I order most often. Amy, this recipe is rockin. Love the pepper jack! Delicious! Such a healthy and filling meal this would make…I am going to make these for my daughter’s lunch tomorrow 😀 Thanks for sharing. I heading straight over for the recipe, it looks fantastic and so great for hurry meal! Being originally from Texas, I absolutely love enchiladas and these sound great. I also love store bought rotisserie chicken. It’s actually cheaper buying those than making it yourself, I swear!! These enchiladas look heaven sent! I would love this right about now! We love the rotisserie chickens too, also known as the “spinny chicken” at our house. Can’t wait to try these. Hi Amy! These look so very good! I adore those chickens too…especially now that I’m a mom! I think we’ll be making a batch of these enchiladas over the weekend. They look too good! I’m realizing that in my furious quest to use all the fresh veggies and put up what I couldn’t, I’ve not been making enchiladas for a while. I made some in the summer when I had more salsa verde than I had canning jars, but it’s time. Luckily, though not a rotisserie chicken, I did pick up a marked down ready to roast/in the bag and everything chicken (for cheap!) so while it’s snowy out this weekend I’ll roast a chicken. Then have enchiladas with the leftovers. Gah, this looks wonderful, Amy. I want to sink my teeth into an enchilada…or three. To download batch account kindly e mail us at support@.